I can sort of understand a desire to have pleats at the top of some pants to create volume. I have pants of that nature, with a couple of pleats at the top, where by "create volume" one means "allow the top of the pants to expand to a point whereby they have sufficient volume to accomodate the volume of me that is occupying them." 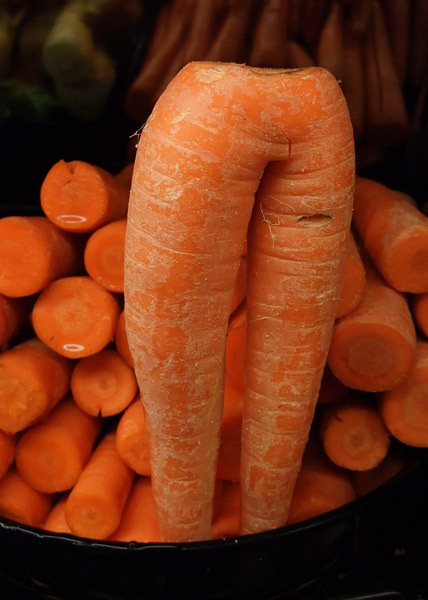 While looking for photos to see what this meant, I came across this photo of actual carrot pants (well, at least, actual carrots). And also this pair of pants, which are carrot pants but even worse.